NEW BERN, NC– Sept. 24, 2018 – Hatteras/CABO Yachts LLC (“Hatteras Yachts”), a world leader in the construction of convertible sportfishing and luxury motor yachts from 45 to 105 feet, today released more details about the all-new Hatteras GT65 Carolina. This is the newest addition to its proven GT Series tournament-ready sportfishing boats, which includes the GT70, GT63, GT59, GT54 and GT45X. The new GT65 Carolina will replace the GT63 and signals a new design direction, enhanced performance and custom features for clients seeking an alternative to either a custom builder or other competitors’ ordinary off-the-shelf boats. The new GT65 Carolina is scheduled to debut in Fall 2019. The first renderings of the new Hatteras GT65 reveal a sleek profile that refreshes the look of the GT Series while still maintaining its core Hatteras DNA. 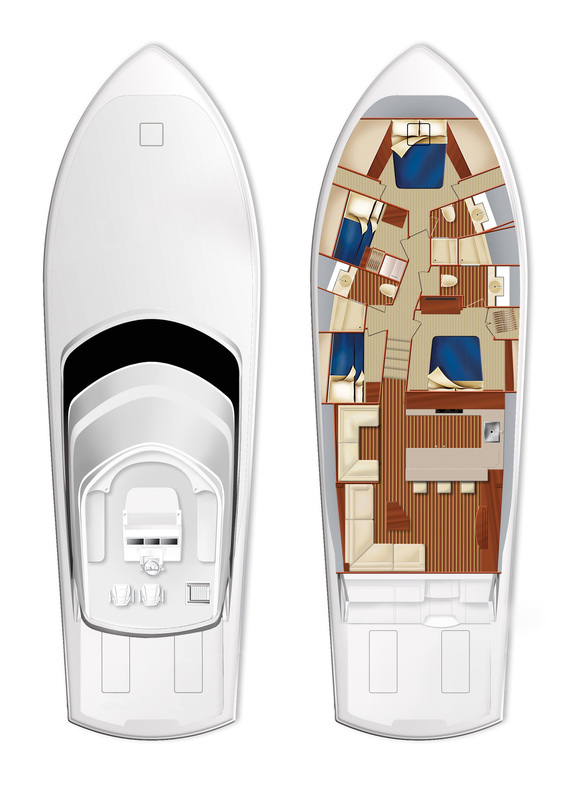 Its new flybridge arrangement features an ergonomically designed console that puts all the controls within easy reach. It also incorporates the latest and largest navigation and fishfinding electronics in a non-glare, flush-mounted, “glass cockpit” helm array. 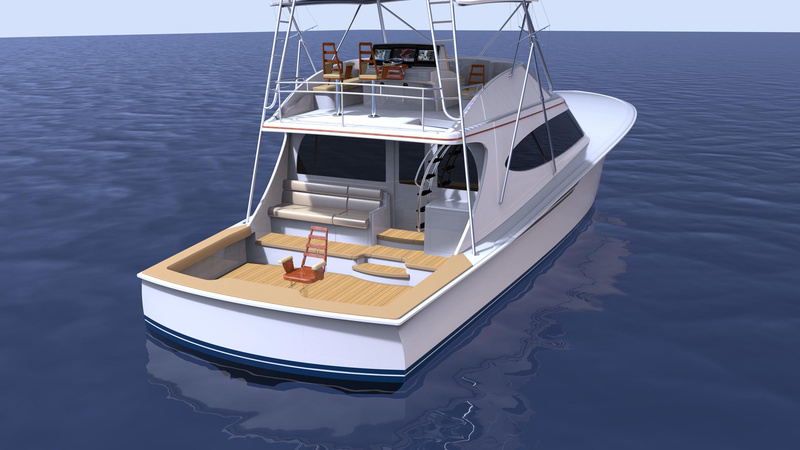 The GT65 Carolina’s added volume is evident in its class-leading 194-square foot cockpit, which is designed for ultimate fishability. The mezzanine incorporates optional integrated seatback air conditioning for all-day comfort, and large stainless steel built-in storage boxes. 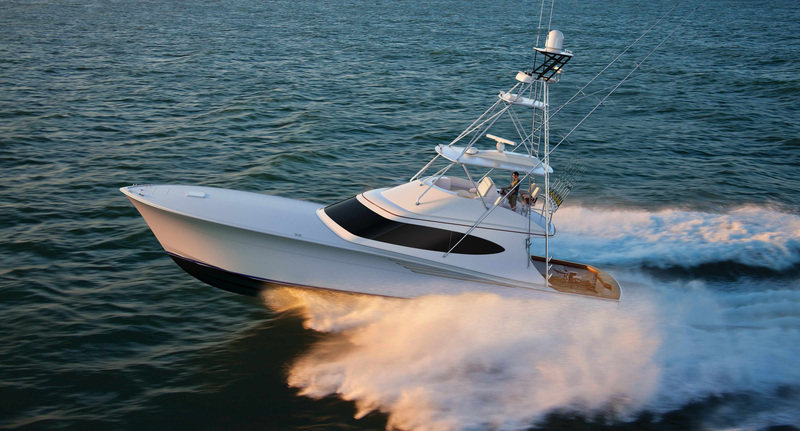 Hatteras Yachts is building the first GT65 Carolina, due in Fall 2019, for tournament-winning sportfishing couple Chris and Laura Jessen, owners of Fish Tank Sportfishing. The Jessens have had tremendous success campaigning their Hatteras GT63 Fish Tank since 2012. Chris and Laura, along with Fish Tank’s award-winning captain, Ben Horning, are collaborating with Hatteras on the new Fish Tank, and the builder has given them the opportunity to customize it to meet their competitive needs. The result is the GT65 Carolina, a tournament-ready sportfishing boat that embodies the best boatbuilding traditions of the brand and state that spawned it, along with features forged by the Jessens’ years of tournament-angling experience. Tackle room in lieu of fourth stateroom. The first GT65 Carolina, Fish Tank owned by Chris and Laura Jessen, also will incorporate custom features such as: tower with carbon fiber hardtop and buggy top, tuna tubes, and a custom wood interior. 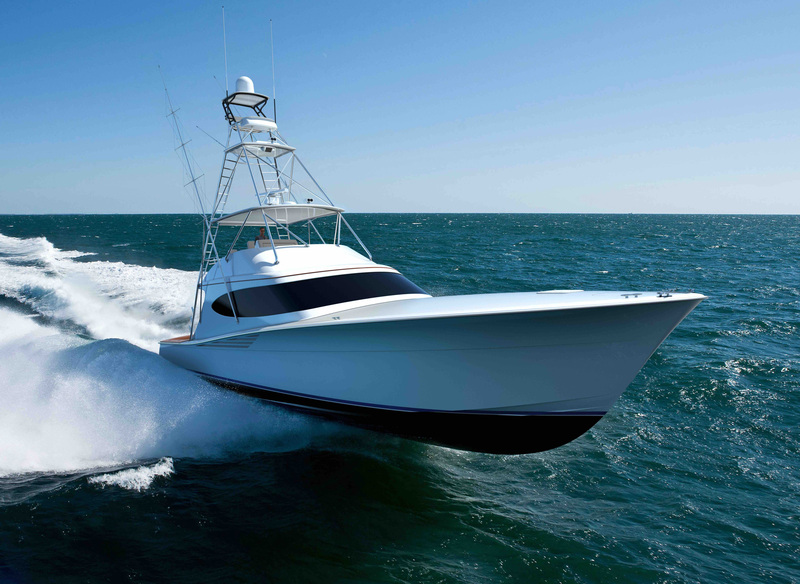 “We’re thrilled to partner with the team of seasoned engineers and boat builders at Hatteras to ensure the GT65 Carolina will continue to enhance our competitive sportfishing lifestyle,” said Chris Jessen . The specifications measurements are approximate and subject to variance.